Browne's Addition Neighborhood: The MAC wants to thank the neighborhood. The MAC wants to thank the neighborhood. My name is Erica Roberts and I am on the Save the MAC committee. I've spoken at a number of neighborhood council meetings about Save the MAC efforts. As you know, the MAC received state funding so the museum will remain open! The Save the MAC committee is planning a "VIP" event for Browne's Addition residents as a way of thanking the neighborhood for their support during the Save the MAC campaign, as well as encouraging their support in the future. We are going to do a "BeGin-esque" type event...it will be on July 6th from 6-8 pm, the DaVinci exhibit will be open with tickets sold at member prices, and we are going to do an ice cream social. 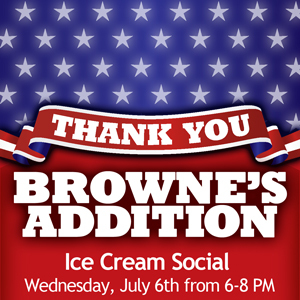 Why: The MAC would like to say "thank you" to Browne's Addition residents for helping to save the MAC! If you are on Facebook, check out the event page and help get the word out!